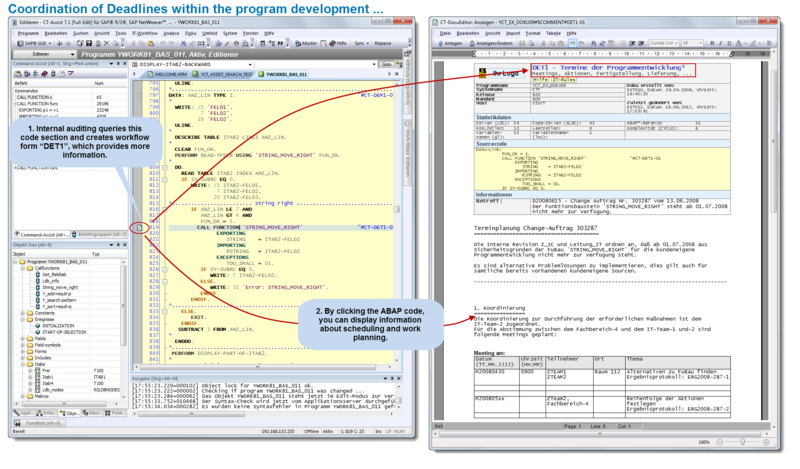 them available in graphical form as a source diagram makes it much easier for you to analyze complex program structures. 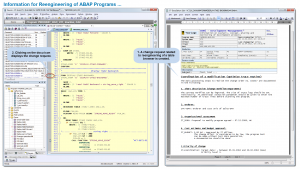 The CT-Assist rooting of the graphical elements makes an ABAP® program transparent and clear. 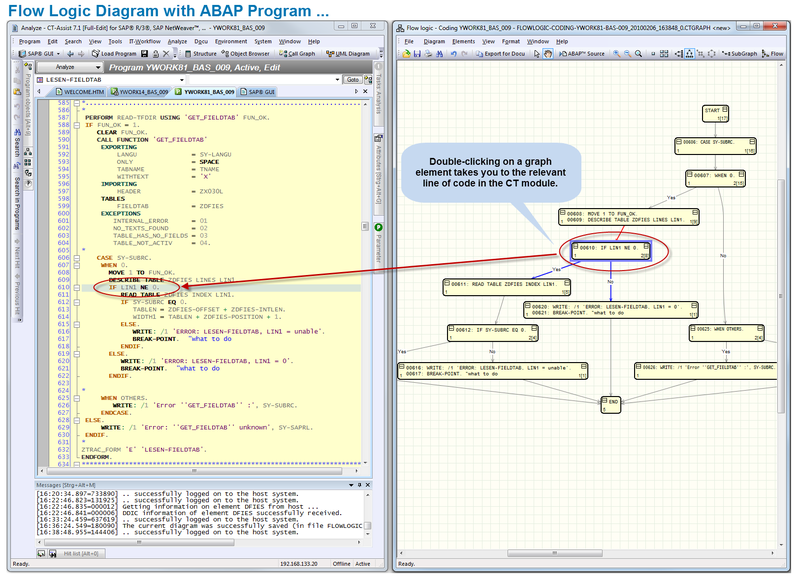 The individual objects in the source diagram are assigned to the relevant code area in the ABAP program using double-click navigation, which means you can quickly find the context for adjacent areas of code. If, for the purposes of reengineering, for example, complex code areas have to be analyzed, a flow logic representation can help considerably in establishing the logical program flow. The systematic representation of the program logic makes it possible to see, for example, previously unnoticed branches within sophisticated IF queries. The result of a command sequence is easier to identify and can be grasped more quickly in a graphical representation. Here too, you can navigate from the graphic to the relevant point in the code by double-clicking. 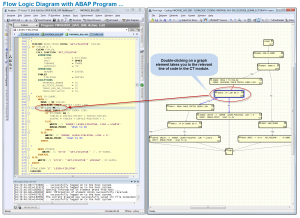 The analysis of programs with ABAP® objects is simplified through the use of UML diagrams. 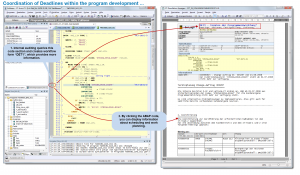 Starting with the current class, other dependent classes are found and shown in a UML class diagram. 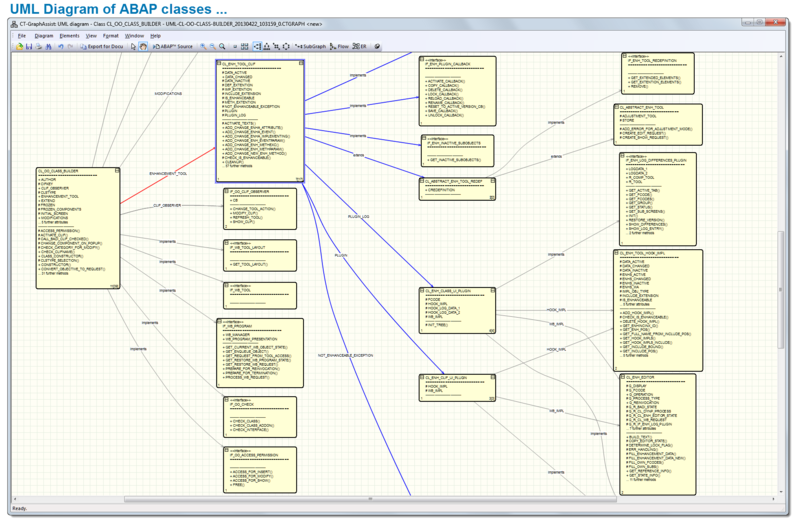 In UML notation, the various ABAP-OO classes (ABAP-OO interfaces) are shown as boxes (with class names, methods, and attributes). By double-clicking, you can navigate from the UML diagram directly to the relevant point in the code (complete source). 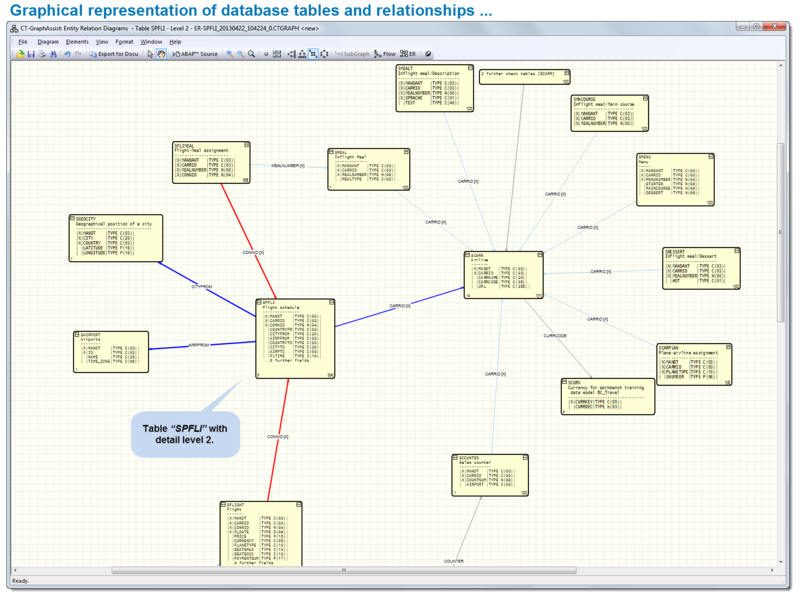 The ER diagram (Entity Relationship Model) enables the graphical representation of database tables and of the relationship to other database tables. 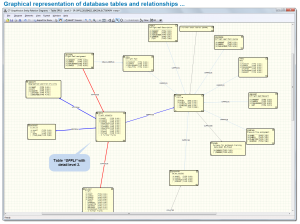 The ER diagram enables you to quickly gain an overview of the organizational dependencies of the database tables that are used in the problem that is being addressed. 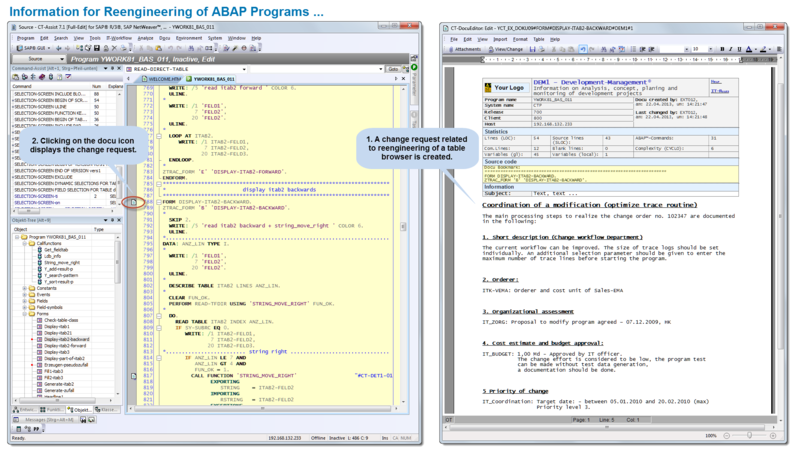 This graphical support simplifies the analysis of ABAP program in contexts such as reengineering, documentation, and error correction. 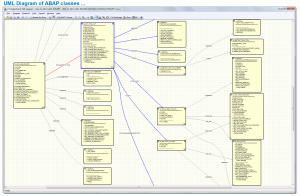 Using the name of a database table as the starting point, the relationships to other database tables stored in the ABAP Dictionary (e.g. check tables) are shown graphically as an entity relationship diagram with various logical expansion levels. 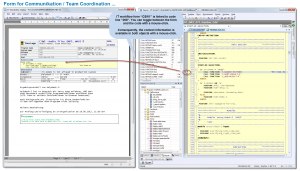 The resulting information objects (schedules, design texts, graphics, meeting minutes, …) can be integrated using special IT workflow forms for IT organization. Audiovisual media (e.g. *.mp3, *.avc, *.flc) are becoming increasingly important for IT work processes. These audiovisual media can also be used in program development for communication and documentation purposes and can be linked to the code. At the end of a project, the audiovisual files can be either used in the program documentation or deleted as required. The security of your company’s applications is supported by the certification of the CT-Add-On by the manufacturer of the ERP software. This certification confirms that interfaces are used correctly, that add-on functions are relevant to the process, and that technical implementation is correctly done. 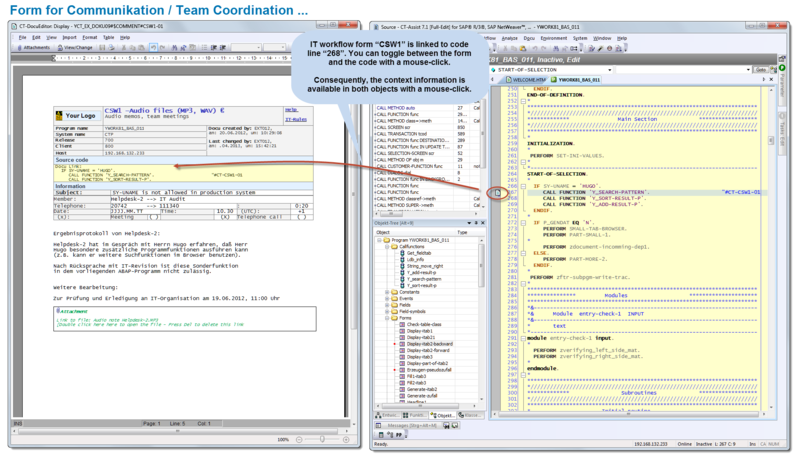 Your add-on product has undergone system integration tests within an ERP environment. Certified software products significantly increase your IT security.